The story of Montreal’s airport train is one of competing proposals by different organizations, bad planning, and letting private entities dictate our transit policy. Montrealers have been waiting for years, decades, for a proper transit connection to the airport. Most large cities have one, and Montreal has been lagging behind. The Caisse’s REM may be just the answer to our prayers, yet it isn’t the first proposal that has been put forward in the last few years. So what happened to the previous proposals? Back in 2010, the Quebec government allocated $200 million for the construction of a direct rail link to the airport. This prompted the public Agence métropolitaine de transport (AMT) and the private Aéroports de Montréal (ADM) to come up with a common transit project. They couldn’t agree on a proposal, so both organizations made separate proposals trying to secure that funding. 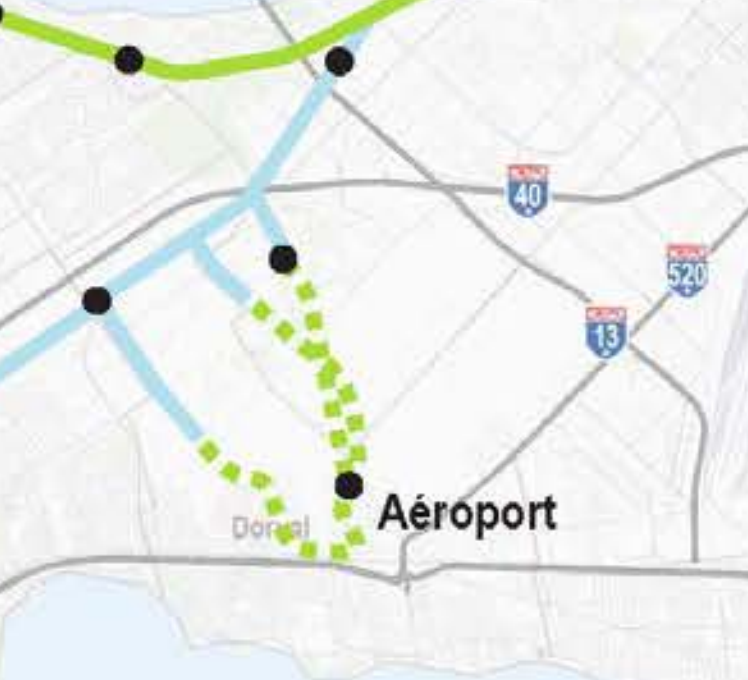 The AMT proposed the “Train de l’Ouest” to connect the Airport to Downtown via the Vaudreuil-Hudson commuter rail line. At the same time, the Vaudreuil-Hudson line would have been upgraded with dedicated tracks from Lucien-L’Allier to Sainte-Anne-de-Bellevue, to remove conflicts when sharing tracks with CP freight trains. 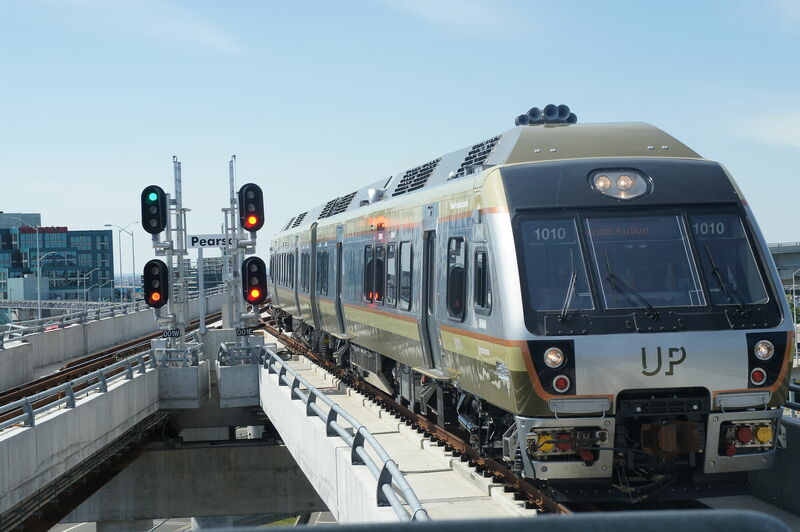 The AMT’s plan was to use the funding dedicated for the airport connection to not only build that airport connection, but also to improve the existing diesel rail line to the West-Island to benefit everyday commuters. Projected cost: $789 million. Despite the projected improvements, the frequency of the line was still counted in trains per day. There was no ambition displayed to have all-day frequency service, no mention of electrification and no new urban stations in NDG, where too many transit-starved residents have to cram onto buses to get to work. Overall, the project was rather underwhelming. However, it was relatively good value for the money, and did try to combine different goals (airport, West Island), using as much existing infrastructure as possible. Aéroports de Montréal, on the other hand, insisted on an express train that would reach Gare Centrale. 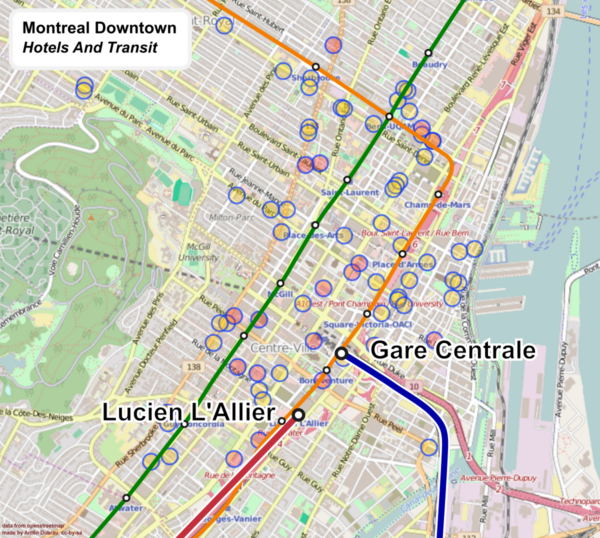 ADM assumed most users will be business travelers going directly downtown, and claimed that a terminus at Gare Centrale would bring in 22 to 30% more riders, despite its worse connection to the Montreal Metro. Some have theorized that the ADM got this number by surveying passengers, asking them where they’d rather take a train. 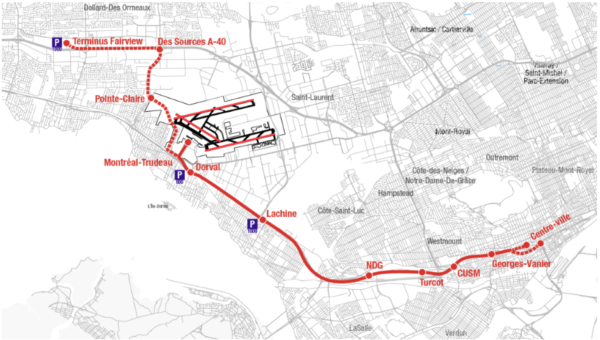 The ADM considered the AMT’s proposal inadequate largely because the train was to “only” end at Lucien-L’Allier, even though it’s only an 8-minute walk from Gare Centrale. The airport intended to connect to Gare Centrale by routing along the CN corridor, a set of tracks currently used by VIA passenger trains and CN freight trains. This option was more expensive and projected to cost around $1.1 billion. Hotels relative to Transit. Source. Given how strongly the ADM insisted on Gare Centrale, we would expect a clustering of hotels around that station. However, looking at the map, we really can’t see anything special with that station. In fact, hotels are pretty evenly distributed within walking distance of downtown metro stations. Which means what really matters is a good connection to the metro, and maybe a taxi stand. A good connection to the metro would also benefit Montrealers in general, who come from the airport and want to go home, not downtown, The connection to the Metro is actually better via the AMT proposal, which has two transfers to the Metro, at Vendome and Lucien L’Allier. Both of these transfers are better than Gare Centrale. The ADM hoped to operate their proposed line at a profit, despite only connecting downtown, by charging high fares, even though this being a bad idea for ridership. 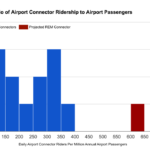 Generally, ridership of airport connectors is low, so running the line profitably often turns out to be optimistic at best. In the end, the AMT and ADM were unable to come to an agreement, and in October 2010, Aéroports de Montréal decided to simply go ahead with their own project, with no consideration for commuters in the West-Island and little consideration for non-downtown airport travelers. And, for a while, it seemed their proposal had won. There was close to no news on the AMT project for years. Meanwhile, the ADM’s project got a boost with the rebuilding of the Turcot interchange, which made made special accommodations for the proposed airport train, at an estimated cost of $136 million. Since the REM now proposes a different route, this money would be completely wasted due to lack of foresight and proper planning. And speaking of lack of foresight and proper planning, it eventually turned out that working with the CN would be difficult, if not impossible. There is actually not enough space along the CN corridor to add dedicated tracks for the airport train, and the CN would not allow tracks dedicated to the airport train on their right of way. So over time the ADM turned their original heavy rail project into an elevated light metro à la Vancouver’s skytrain. In 2012, the ADM proposed an actual skytrain, moved the routing partially away from the CN corridor, and added extensions into the West Island. Two years after shutting down the AMT proposal, it seems they came to realize it would be easier to secure funding if the train had more purpose. The ADM’s new plan included intermediate stations between the airport and downtown, although they still wanted the airport train to be an express somehow. At that point, it was unclear where the downtown terminus would be; maybe Gare Centrale wasn’t so important after all. The plan used the rail corridor that is being built as part of the Turcot project, and it even included a station there, labelled “NDG”. Except a station there is not very useful, being sandwiched between a river, the highway and a cliff. Up on that cliff is where the actual populations are, where the existing AMT lines run along the CP line, but where there is no station. At this point, this project fell into somewhat of a limbo. In Toronto, there was a similar proposal to create a airport express to Pearson Airport, put forward by a private consortium, claiming the line would pay for itself. The proposal was put forward in 2003, but the private investors withdrew several years later when profitability became questionable. 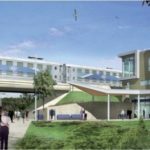 So Metrolink, the region’s transit planning and commuter rail agency, took over the project, and built it for nearly half a billion dollars, as an express train making two stops along the way. The project costs were kept relatively low because they used their existing commuter rail infrastructure. The line started operation in summer 2015, with fares that were originally extremely high, around 27$. Ridership was extremely low. It’s doubtful the line will ever pay its operating expenses. The fare was recently reduced to 12$, and the ridership increased a lot, partly because it is now attractive for some commuters. By now the ridership has surpassed 5,000 riders a day. Even though Pearson airport has twice the passengers as the Montreal airport, its airport express only receives half the ridership that the ADM projected for Montreal. In January 2015, the Caisse de dépot et placement du Québec took over Montreal’s airport train project. The liberal government gave them the mandate to build an airport rail link, a connection to the West Island, and a rail connection to Brossard via the new Champlain bridge. 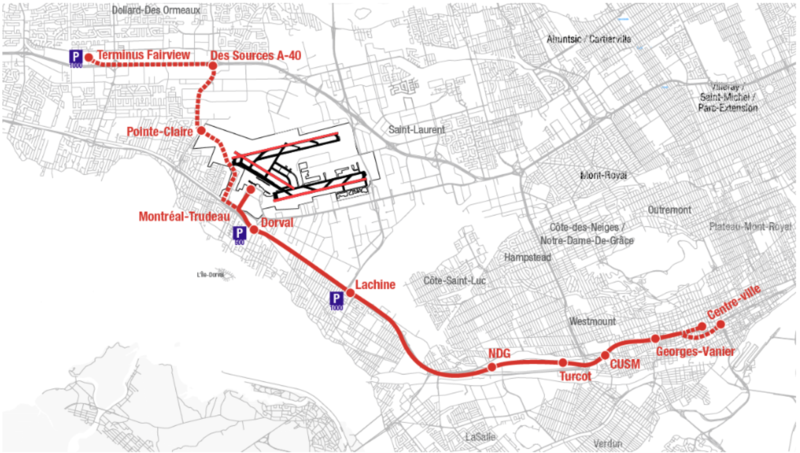 In late 2015 the Caisse realized that the Turcot rail corridor would not be available until 2022 or so, so they looked for an alternative path to get downtown. They came up with the idea to built a 5km connection from the airport towards the north, to reach the existing Deux-Montagnes line, rather than connecting just a couple of hundred meters South. Looking at the REM project as a whole makes it appear much more sensible than the previous ADM proposal. Rather than connecting 10,000 people, we’d get a regional network that would get 150,000 riders per day, at a much more “reasonable” cost of $46,000 per added rider. But just because the project looks okay as a whole does not mean every section makes sense. In fact, just the airport spur may end up being as expensive as the previous ADM proposal. The problem is the long connection to the to the existing rail right of way, which consists of several kilometers of tunnels and elevated tracks. The image below shows 3 options the Caisse is currently considering to reach the airport. There is already a station shell under the airport, built by the ADM back in 2009 for 25$ Million. Unfortunately this station points south, because it was always assumed that any rail connection would connect to one of the rail corridors to the South. 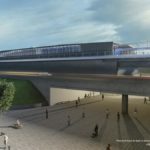 The Caisse may end up not using the station, because looping around the airport to reach the station may end up being more expensive than building a new one – meaning more millions may get wasted due to improper planning. 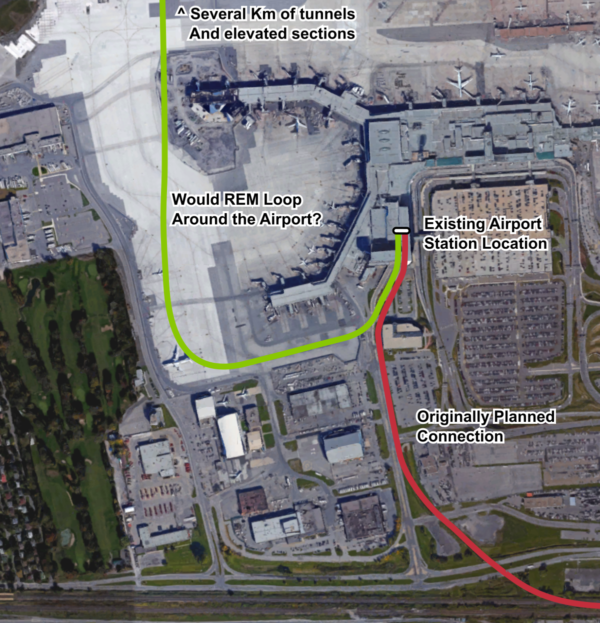 If trying to use the existing station, REM would have to build through an active terminal, or loop around the airport . That detour is about as long as the originally planned connection to the South. How much just the airport spur will cost is unclear, as the Caisse didn’t give any detailed construction costs. In a previous post, I tried to estimate the construction costs for all the different segments of the REM projects. The estimate for the airport branch came out to about a billion dollars, although it could also be a bit cheaper (update: new numbers by the CDPQ show it could cost around half a billion dollars). Nevertheless, it appears just the airport spur will cost an amount similar to the original 768M$ Train de l’Ouest proposal by the AMT. Yet that project also included new tracks along the entire Vaudreuil-Hudson line all the way up to St-Anne de Bellevue. Basically, we’re giving up building a line used by 50K riders per day so that the Caisse can have an airport connection that will hopefully bring in 10K riders instead (update: new numbers by the CDPQ show ridership to be 2,700 with future potential for 4,200). When I asked the Caisse’s people how their project relates to the original AMT project of use the existing CP corridor and only building a couple of kilometers of new track to the airport, I got the distinct impression that they never considered it. They kept going back to saying that the construction on the Turcot project means the corridor won’t be available until 2022, when that is only true for the CN corridor. They also talked about grade crossings – when in fact there are only two grade crossings between the airport and downtown, whereas there are 14 along the Deux-Montagnes line, which will all have to be removed due to the choice of using an automated light rail technology. Finally they said they want the lines to form one connected network, and better combine operations. This part I don’t really understand. Why can’t the airport connection just be combined with the AMT network’s operations? What matters is that all the different transit lines of Montreal form an overall network, not who exactly operates which lines. What matters is the connection to the metro, which is actually best along the CP line, at Vendome. Just days before the REM project was proposed to the public, the government announced that the AMT would be split up into two organizations, one doing regional planning and the other engaging in operation of suburban lines. The new planning organization will be governed by a committee mostly made of Montreal region mayors. Given the timing with the REM project, and the history of not listening to the AMT, one has to wonder how all these events relate to one another. The airport project has been a mess. While Toronto simply went ahead and built their airport using their commuter rail infrastructure, we’ve been shuffling around competing projects. The whole transit planning process has become way too politicized on the one hand, but way too influenced by private interests on the other — Rather than letting the public agency that is tasked with regional planning do the actual transit planning, we let private entities that have no business planning transit do that job instead. And it seems that these private entities, the Aeroports de Montreal and now the Caisse, have more power than the AMT. The AMT meanwhile is getting quietly dismantled. Then again, while the AMT still had ‘power’ of sorts, it was engaged mostly in suburban-centric park-n-ride-centric commuter rail planning, that’s what got us the ineffective Mascouche line. In effect, the shift of transit planning towards private entities is effectively removing planning from democratic control. We really need better, integrated, regional transit planning; done by the public. We need to stop the hodge-podge of competing proposals, or proposals that undo hundreds of millions of previous investements. We also need to prioritize projects based on cost-benefit, but still always work towards a long-term vision of building a large network. We should consolidate the number of technologies, to achieve good expertise and economies of scale. Finally, we should try to leverage existing infrastructure and investments as much as possible. Filed under Montréal, REM, trains. Then, airport trains for Dorval & Mirabel are nothing new. I have seen several proposals for Mirabel, in the 1970’s, one going to Mirabel via the CPR and the others using the obvious Deux-Montagnes line. The project via the CPR was the most grandiose; from Park Avenue station, the train would have gone through a totally new 4 km tunnel under Park Avenue, with a deep underground station at Place-des-Arts, and a deep terminus roughly under Place-Ville-Marie & Central station, with a corridor to Windsor station. There would have been station stops at Park Avenue, Bordeaux, St-Martin, Ste-Rose, Ste-Thérèse, St-Janvier and Mirabel. Rolling stock would have been catenary-fed with high-platforms. 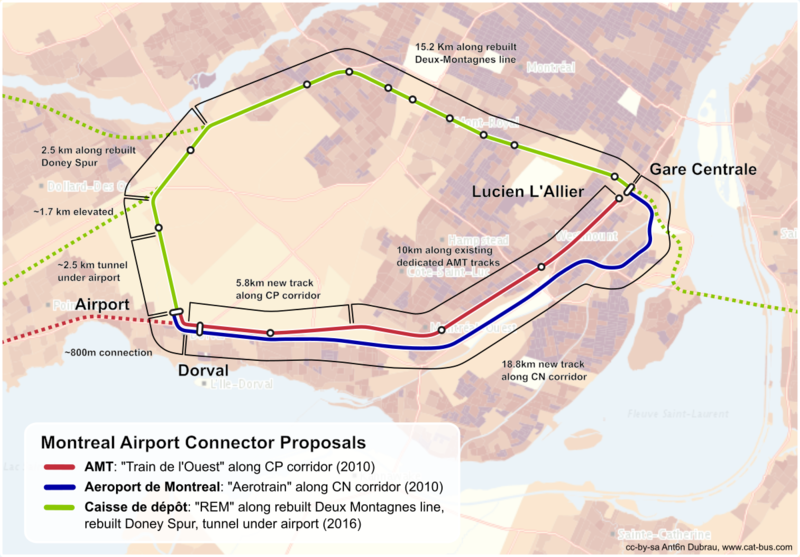 One proposal with the CNR Deux-Montagnes line actually had a spur going to Dorval airport, via the Downey spur, then via a new track along montée St-Rémi (slightly east of montée Des Sources) going around the airport and with a terminal probably parallel to the airline terminal. The train’s main purpose would have been to connect with Mirabel airport, with some trains going to downtown Montréal, just like the REM would do. and the map of the proposal (which, finally, also used the Deux-Montagnes line). I am fairly positive that this sent Drapeau in a frothing frenzy; imagine! Good suburban transit! That would bleed Montréal dry! That Place-des-Arts station is insane. So many mezzanine levels, including a level with cars! How do we get you on a committee or something? I would support an Anton Dubrau political campaign, you’re spot on! • The AMT abolition was announced in April 2015, a full year before the REM project was announced to the public public. The Caisse had already received its mandate by this point. However, it’s doubtful the issues are directly related. The CMM had been asking for years to have control over transit planning, and by 2015 the CMM was mature enough and the AMT was weak enough (after the Joël Gauthier/Train de l’Est scandal, etc.) for the announcement to be made. • The metro/train connection at Lucien-L’Allier is not really preferable to Bonaventure/Central Station; both are outrageous, but for different reasons. Lucien-L’Allier could be mitigated with a bank of elevators, however. 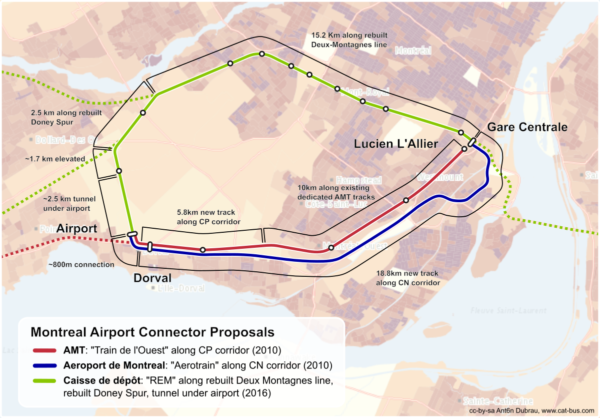 • The ADM-via-CN project wasn’t about using Central Station at any price, it was about avoiding the mess that is Lucien-L’Allier terminal. If the dreaded Molson Centre had not destroyed Windsor Station in 1996, the ADM would happily have had the airport train terminate there. Without that option, they were not willing to accept the CP line because of its inadequate terminal (designed and built at a time when the commuter traffic at that point was one-third what it is today, and probably expected to stagnate or decline, so with no room for expansion – this was before the AMT existed). • The AMT made several attempts to obtain a proper downtown terminal for the CP Lakeshore line. There was a proposal to bring the CP tracks onto an elevated viaduct over the Ville-Marie tunnel and have them enter Central Station via Place Bonaventure; a proposal to bring the tracks a short distance south over Saint-Antoine Street to a new terminal on the southwest corner of Peel & Saint-Antoine (where the Queens Hotel used to be), connected to the great hall of Windsor Station by a pedestrian passage over the street; and finally a modest proposal to enlarge Lucien-L’Allier terminal on its current site to make it at least adequate for the passenger levels it serves. The first two, which were ambitious ideas, would have needed a high-quality architectural design and a careful public relations campaign to go anywhere. Instead the AMT hired generic engineers and allowed the lacklustre reports to be rejected at first glance by the city. • Transit planning should not be under democratic control; it needs a balance between priorities expressed through elected representatives and intelligent technical solutions from people who understand technologies and operations. Too much political input → the Toronto mess over Scarborough rapid transit. Planners in a vacuum → the metro plans of the 1970s with stations and even whole lines in the wrong places. Also, we build so little transit that there is a lack of experience to inform expertise. • If you want to trace the problem back even farther: A serious proposal to build a Union Station was made in February 1929. (Central Station, 1943, is its much-diminished outcome.) The station would have been on CN lands but accessed from both CN and CP tracks. Unfortunately, at that time CP would have nothing to do with the idea of collaborating with the hated rival in its home city, and in any case the Depression began not long afterwards. The failure to integrate the CN and CP networks in the 1930s and the later abandonment of both CP terminals (Viger and Windsor) has left us with difficult unsolved problems, 80 years afterwards. The better connection of the CP tracks to the Metro exist via Vendome, where the transfer is relatively short and convenient. Lucien l’Allier is also shorter than Gare Centrale, and could be made even better via a second concourse on the West Side of the station, as you mention. Roofing should make the station adequate. If the station were operated with quick turn-around times, the capacity issue is moot. Worst case, one flyover/fly-under could double turn-around capacity. Lucien L’Allier is far from great, but I don’t see how the terminal is ‘indadquate’ except for aesthetic reasons. Certainly not a valid reason to spend a billion dollars. One should expect that Montreal would eventually build an East-West heavy rail tunnel, continuing the terminal, as many cities have done and are doing right now. The billion dollars could’ve already created an underground connection to about Gare Centrale, once the Palais-des-Congress is reached, the over-dimensioned autoroute 720 could provide a right of way to get to the other end of downtown for cheap. Regarding democratic control – I think my point was pretty clear that right now the problem is that transit policy is too much driven by political considerations on the one hand and private interests on the other. What this means is we should have a public organization that has the expertise to plan transit, with participation of the public, with public consultation, public oversight, and with the public interest at its heart. So my point is as yours. Judging by the semi-sanctioned westard extension of the Pink-Line into Lachine, it morphing into a through-city converted electrified Lakeshore Line wouldn’t surprise me. I suspect ADM will keep their station box dormant until the advent of business-class express service branching into the Lakeshore Line, much like the Heathrow Express. I find the REM’s connectivity into the airport to be a gracious nod to your average Montréalais; I’m suspicious, however, of their driverless trains come meddlesomely icy weather. Along with big business, the Coalition Avenir Québec will undoubtedly pursue REM expansions.